Cryptopia.co.nz Review – Viable All-In-One Crypto Platform or Scheming Operation? Cryptopia.co.nz is an online cryptocurrency trading platform that possesses no equal. Apart from serving as an expansive investment platform, Cryptopia also provides exchange services, an integrated marketplace, a news center along with a sweeping crypto forum. Currently supporting over 30 million monthly visitors, this vast cryptocurrency platform has experienced over a 126% increase in visitor traffic since last month. Despite Cryptopia’s astounding boom in popularity, recent consumer feedback has paraded against their platform due to problematic user experience. Which leads us to address the question floating around in the back of everybody’s mind, can Cryptopia be trusted? The focus of this objective review is to not only answer this question for you but to provide you with inquisitive insight which should enable you to make a far more educated decision as to whether or not Cryptopia is a crypto platform suitable for your investment endeavors. The Cryptopia investment platform may appear a little overwhelming to investors who are new to cryptocurrency exchanges. While no leverage or margin investing are supported like with other cryptocurrency trading platforms that support FX or CFD options, Cryptopia functions entirely exchange based where cryptocurrencies are exchanged through their platform. Supporting hundreds of different digital coins, one would be hard-pressed to find an investment platform that supports such an extensive variety of cryptocurrencies like Cryptopia. Apart from serving as probably the most expansive exchange platform, Cryptopia receives much praise for one of their more innovative features known as Arbitrage. Where investors are spared the annoyance of having to open multiple browser tabs to compare trade prices from other competing websites. In addition, the charting solution featured at Cryptopia.co.nz is MetaTrader4, which provides traders with a customized charting experience where they can manipulate the solution to fit their needs. Traders, for instance, are able to change the time frame of their charts, add a variety of technical indicators and review fundamental analysis stats regarding that designated assets past 24 hours. Since Cryptopia only supports an exchange style platform, only buy and sell orders are able to be executed on their platform. Other notable integrations that should be known about Cryptopia would be how they offer a Lotto, News Center, Rewards and Paytopia, which enables consumers to purchase additional services provided by Cryptopia. The marketplace at Cryptopia is an interesting integration that supports a wide variety of consumer goods or service offers. Auctions, buy/sells along with job opportunities based upon payees needs are all featured throughout the broad marketplace. As you can see in the image below, the Cryptopia marketplace supports up to 19 different categories while allowing users to narrow search criteria by using demographic specifics and search filters to yield more relevant search results. Due to how widely used the Cryptopia platform is, naturally the forums featured on their site harbor thousands of threads and posts. Among the most commonly active threads featured at Cryptopia would be the Information, Altcoins, Trading, Marketplace and Services forum. Trading concepts are a popular topic of discussion in the trading forums although we did find some complaints regarding users not receiving full value for withdrawal or deposit requests. In fact, some users have even had a difficult time reaching support recently or finding resolutions to their complications. 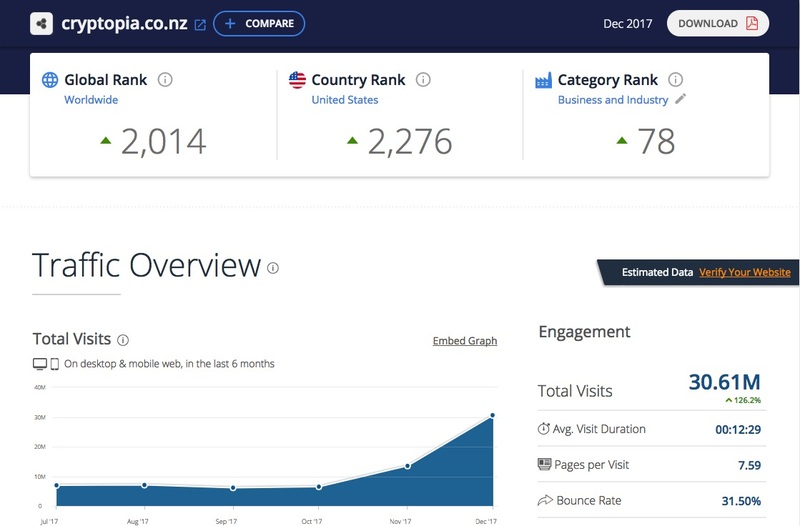 Whether this is largely in part due to the immense surge in traffic that Cryptopia.co.nz has been experiencing or not it is difficult to determine. Which is why we are urging investors who have any first-hand experience with Cryptopia to please share your feedback below. Other forum sections that appear to be popular would be the regional forums where the forums are broken down according to the following dialects: Spanish, Arabic, Chinese, German, Phillippines, French, etc. Cryptopia.co.nz was created on May 7th, 2014 and was registered by Rob Dawson, one of the founders behind the Cryptopia exchange. The other co-founder behind Cryptopia is Adam Clark while their company, Cryptopia Limited, is registered under company number 5392901 and was incorporated on July 29th, 2014. 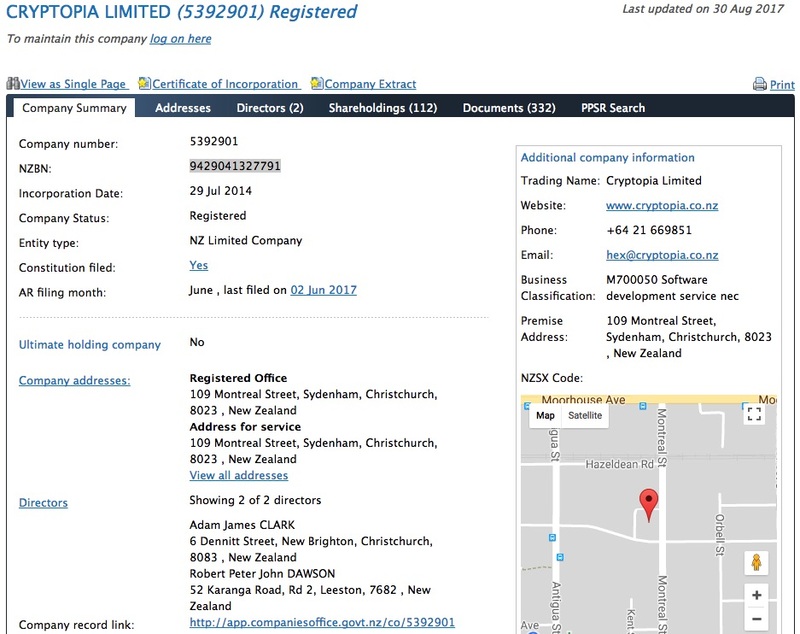 Operating as a New Zealand limited company, the registered office address of Cryptopia Limited is 109 Montreal Street, Sydenham, Christchurch, 8023, New Zealand. Cryptopia operates in accordance with other competitive exchanges when it comes to the trading fees they charge. Fees are set at a fixed 0.20% volume for each investment that takes place through their exchange platform while zero pool fees for coin housing are charged. Cryptopia isn’t too upfront regarding their payment methods like some crypto exchanges tend to be. Depending on which cryptocurrencies you wish to exchange, traders must register for an account then verify their account where they will then be able to deposit any of their supported cryptocurrencies into their platform. Fiat currency for the time being is not accepted, which is why depending upon where you live using a fiat friendly exchange platform is encouraged so that you can acquire cryptocurrencies. Both positive and negative investor feedback can be found throughout the Cryptopia forum or the web. Among most of the complaints we found on the web would be from investors who claim that they have not received their deposit or withdrawal value in full or unprofessionally long support response times. While some users on the other hand have reported great success while using their platform it becomes obvious to us that this exchange must be doing something right to host such a large user base. cryptopia is very safe , good exchanger and very trusted…iam use crypto-is deposit and withdraw without problem. Fast site, but not that easy to use and the fees are ridiculous. No problems with transfer (deposit + withdraw). The support doesn’t reply. I prefer binance and strongly recommend that instead. Everything is fine until you encounter a problem, then no support at all, in my case cannot withdraw anything directly from my wallet. I used them and never get any problems or any delays in sending and receiving deposits and withdrawal. Tho the volume of some coins there is not that huge to compare to some exchanges like bittrex. But you can trust them IMO. To learn more about the various forms of feedback circulating this exchange, feel free to visit BitcoinTalk.org, TrustPilot.com or the Cryptopia forum. TheCryptoBot is one of the most effective automated cryptocurrency traders readily available within the online investment community. Synced with transparent and reliable exchange platforms, the GunBot is synced with the Cryptopia platform so investors who have shown interest in this widely-used exchange can maximize their earning potential by signing up with GunBot where they would likely be able to sign up with the Cryptopia platform as well depending on where they reside. To learn more about the GunBot automated system, read our complete GunBot review or our TheCryptoBot user guide. Cryptopia.co.nz is one of the most diverse cryptocurrency opportunities that effectively performs as an all-in-one platform. Despite negative investor feedback, Cryptopia is a booming cryptocurrency destination that is utilized by millions of cryptocurrency traders around the world. While their customer support system could use some work, we suspect this ordeal to be handled swiftly due to their increased user base. Overall though, we were impressed with how popular and innovative the Cryptopia platform operates and for the time being we are classifying this cryptocurrency exchange as trustworthy. What’s your opinion regarding Cryptopia? Please share your feedback below regarding this Cryptocurrency Exchange. To receive free reviews and scam warnings via email, please subscribe to ScamBitcoin.com!